It's no secret that I'm a fan of Ekiben. I wrote a piece about them almost two years ago sort of comparing them to the beginnings of the Momofuku empire, I've eaten there more times than I can count, I'm a regular attendee of most of their pop up events (the lines for the Blacksauce event are still making me angry), and I'm friends with their owners though I'm not sure I'll answer to "Uncle Lenny" if they call me that again. That being said, I think it's still important to write about what Ekiben means so much to Baltimore's food community and maybe to Baltimore as a whole. If you love food and live in Baltimore, then you've probably heard of Ekiben. They've certainly gotten a ton of local acclaim and have attracted their share of national press. 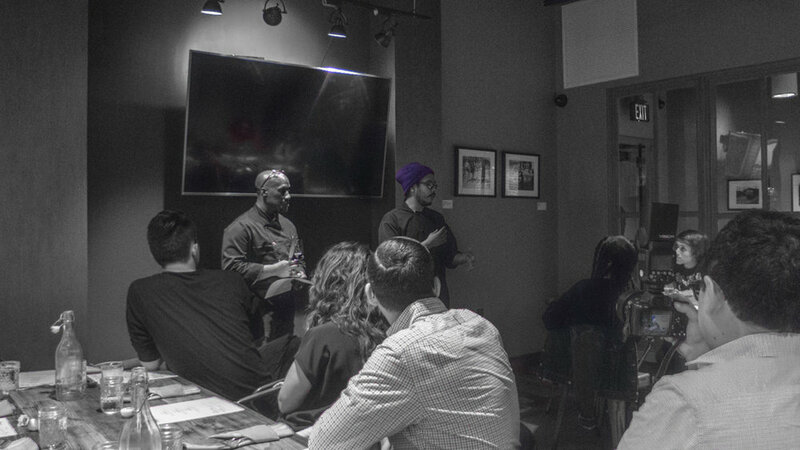 You're probably familiar with the story of Steve, Eph and Nikhil, three guys from UMBC who decided to start a food concept. 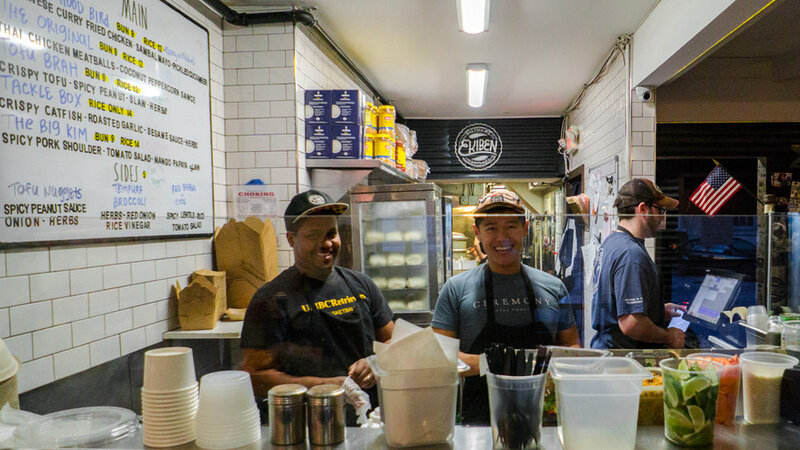 It started with a bike and hawking their bao during farmer's markets and all around Fell's Point. It led to a shop in Fell's Point and now two years after that shop opened, their popularity hasn't let up and they've already established themselves as a Baltimore institution. To me, Ekiben is a bellwether type of restaurant. They’ve managed to figure out what works best for their business model not only for them but also what works for the City of Baltimore. They are unabashed about the food being their flavors and not necessarily belonging in any one category or ethnicity. While their buns and rice bowls are rooted in Asian cuisine, they are not afraid to pull flavors from places as far ranging as Baltimore and Northern Africa. 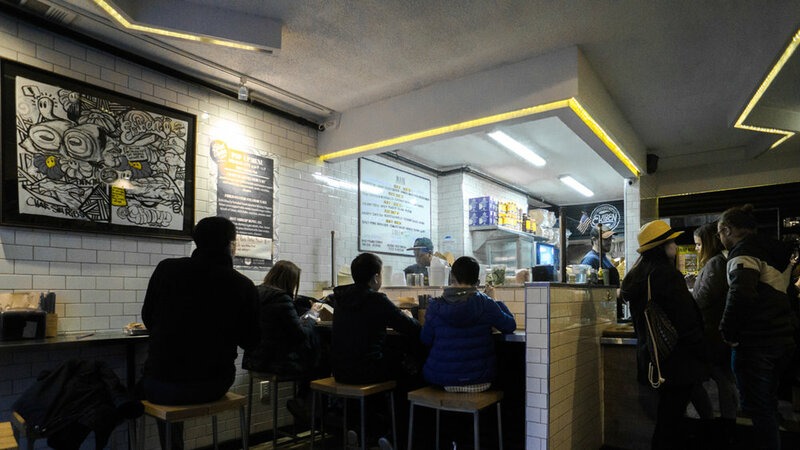 For their 2nd Anniversary, they decided to celebrate their versatility by inviting one guest chefs to create and serve their version of a bun or rice bowl for each day, which started on March 12th and led to a final celebratory feast in March 18th. The line up was a who’s who of some of Baltimore’s best chefs. Chef Julian from Tagliata kicked it off on Monday. Damien and the crew from Blacksauce Kitchen were supposed to appear on Tuesday but some unfortunate circumstances forced them to cancel. Chef Ben from La Cuchara served up buns on Wednesday. Steve Chu’s dad, Papa Chu took over on Thursday (unfortunately, couldn't make that one -- sorry Papa Chu) and The Local Oyster represented on Friday. The week was capped off by a Kamayan celebration on Sunday at La Cuchara. What? A Kamayan? Isn’t that me? Isn’t that my heritage? I remember Steve sharing the menu with me since I had pitched to the Baltimore Beat a story on Ekiben’s anniversary and the timeline was pretty condensed so I was asking Steve for anything on the guest chef appearances. I also remember saying to him, “Are you stealing my people’s food?” when I saw the part about the Kamayan. At the time, I was convinced I was half-joking but I also knew I that I had a fired up initial reaction when I saw someone, who wasn’t Filipino, cooking up something as significant as a Kamayan. For those of you who don’t know, a Kamayan (literally translated as “eating with your hands”) is a communal feast from the Philippines. The origin of the feast goes back generations but it has become a symbolic defiance of the influence of colonialism on the Philippines since Spanish colonists used to force Filipinos to eat with utensil lest they be considered savages. Kamayan was a way for Filipinos to claim back their ceremony while at the same time rejecting colonial influence. However, to me, the concept of Kamayan has evolved and adapted to Filipino American (or Canadian) culture. The idea of a communal feast for Filipinos is a tradition I’ve seen in every Filipino community from Toronto to Northern Virginia. There has always been a tradition of gathering at someone’s house with more food than you can possibly eat. There is always lumpia, there is always pancit, there is always some sort of BBQ meat on a stick, there is always lechon, strangely enough there is always fried chicken and of course rice. You are surrounded by Titos and Titas (Uncles and Aunts) even though they aren’t your real Titos or Titas. It is a simple celebration, an attempt to keep your community vibrant even though you are far away from the homeland. This is what Ekiben (and to some extent, La Cuchara) was trying to claim from us? By saying that someone else can claim a Kamayan or a spirit of community is saying that we have ownership over that. Yes, it is a feast borne of the Philippines so in essence we are caretakers and historians and storytellers about what Kamayan means but that does not mean we have own it. I haven’t come to this conclusion lightly and there was a lot of angst in the Filipino community about Ekiben putting on a Kamayan with essentially no Filipinos involved. There were discussions had and Ekiben was kind enough to sit down and listen to some impassioned voices about the significance of a Kamayan. I wouldn’t dream of speaking for those voices so I can only tell you that my own personal experience with thinking about this particular Kamayan was eye opening. During these discussions, there were topics brought up as to what should be cultural identifiers. Does speaking the language make your more or less Filipino, does visiting the country of your birth/heritage, make you more of less a representative of the Philippines? They were never asked directly of me but they did bring up some thoughts about the immigrant experience. The first thing I realized was as a child of immigrants being raised by immigrants in countries that were so foreign to what we were born into that my parents had to learn how to adapt and on top of that, learn how to adapt while at the same time making it as easy as possible for their children to not feel like they needed to adapt or that they didn’t belong. They had to adjust to places that were not predominantly our culture, not our race, not our faces. They chose to make sure I spoke English without an accent. They emphasized North American culture so we would fit in. They made choices for their children to try to ease the burden of their otherness. They've never spoken about it but it must have been heartbreaking for them to make that choice and I'm forever grateful that they made choices on what they thought was best for me. It’s interesting when we have cultural appropriation discussions with food and just in general that we skip right by the cultural part and focus on the appropriation since there is such a uniformity associated with the definition of that word. In this particular discussion, I got stuck on the cultural part. What defines an accurate cultural representation? Is it my language? Is it my upbringing? Is it my family? It’s an important question because I can’t hide my Filipino-ness and because of that, am I representing my culture to the best of my ability? I don’t know if you’ve heard about Aubergine, a play about the role food plays in one’s culture and in this case it’s Koreans and Korean food. I’ve heard nothing but amazing reviews from everyone that has seen it. I’ve wanted to go because I enjoy this kind of commentary and it has been highly recommended. At the same time, I’ve been reluctant to go because while everyone with an immigrant background has said how close to home Aubergine hits, I’m more worried about whether it doesn’t hit close enough for me. That whether or not I can completely identify with the immigrant experience portrayed in the play. However, I would'nt trade my upbringing or my sense of cultural identity with anything else. But, in being raised the way I was, I’d associate my identity more so as Filipino American (or Canadian) rather than just Filipino. Even though I was born in the Philippines, it’s not the country or even the continent that resonates with me the most. My history is here in the States and in Canada and while I so see myself as Filipino first (I mean that’s what everyone else sees first also), I also strongly identify with my cultural ties to having grown up here. I guess I’m saying that in terms of culture, in terms of self-identity, it isn’t just the Filipino side I identify with, it’s both the Filipino and CanAm (ha) parts of me that I see as making me whole. I think the journey of growing up Asian in North America is what makes our experience. We all may live in households that emphasize your Asian upbringing but once you step outside your doors, it’s no longer our world even if some of us grew up in predominantly Asian immigrant communities. I’m fascinated about the struggle to maintain our Asian heritages while adapting to this country. I’m fascinated that it’s brought about a cultural identity of its own that sometimes ignores your country of origin and simply can be called Asian American. With all that being said, here’s where I ended up with Ekiben’s Kamayan. After, I moved from Toronto, I grew up in an environment where Filipino experiences were few and far between and I was always excited and proud when I saw Filipino food, culture, festivals etc…outside of my own household. I was proud regardless of who was behind it. So, I’m happy that Ekiben decided to put on a Kamayan and I tried by best during the weeks leading up to it to help them understand the ideals of a Kamayan. I realize that within the Filipino community there is an idea that we have to protect our heritage, that we have make sure we are leading the charge and benefiting. I deeply respect that and I also think there is some room for us to adapt. We have to celebrate the pockets of our culture that do see some light and try to ensure that these traditions are being treated with respect and honor so that it can continue and more Filipinos can be involved. However, this shouldn’t be said lightly and it’s definitely not an accepting blanket policy that applies to anyone who wants to carry out Filipino traditions. In my mind, Ekiben is in a unique place to present a Kamayan to Baltimore. They’ve garnered a following in Baltimore across all communities and like I said above, their flavors are not strictly Asian (maybe Asian adjacent) and plays in a multitude of cuisines. They’ve helped introduce the world of rice bowls and baos to Baltimore and while they’re not the first, they have certainly done it with a youthful vigor and style that works for this city. They have been respectful to their roots and while the choice of doing a Kamayan was maybe done more casually than it should have been, they were right in choosing a Kamayan if they wanted to celebrate a unique communal and celebratory experience that had its roots in Asian culture. I have gotten to know these lads and I had become comfortable enough to know they would be respectful to the spirit of a Kamayan. But, before we get to the Kamayan, we should review the week that was Ekiben’s 2nd anniversary. You need not go any further to measure the impact of Ekiben to the food community in Baltimore, then to see the line up of guest chefs that came and created a bun or bowl for the week long celebration. My goal was to go to every pop up but unfortunately Blacksauce had to bow out due to a fire at their brick and mortar location and I had a conflict when Papa Chu came to cook. I did manage to go to Chef Julian's (Tagliata), Chef Ben's (La Cuchara) and the Local Oyster. All I can say is that there's magic in those buns because while the Chefs stayed true to the flavors they sling at their respective restaurants, the buns and the rice bowls were all still true to Ekiben. All the food I tasted were all highlight unto itself, but let's talk about that anchovy sauce on Chef Julian's veal tongue bun, Chef Ben's combination of shishito, manchego and serrano was brilliant, and I don't know why they don't make more po' boys on bao. Now to the Kamayan. If the purpose of a modern day Kamayan is to celebrate community, family and food then Ekiben's version of Kamayan was successful on all points. First off, the menu: sticky rice, crispy suckling pig, grilled yellowtail collar, grilled short ribs, dumplings, grilled pork belly, crispy salt n pepper head on shrimp, pickled vegetables, cilantro cashews and a whole lot of dipping sauces including house made liver sauce for the suckling pig and bagoong (shrimp paste) for everything else. 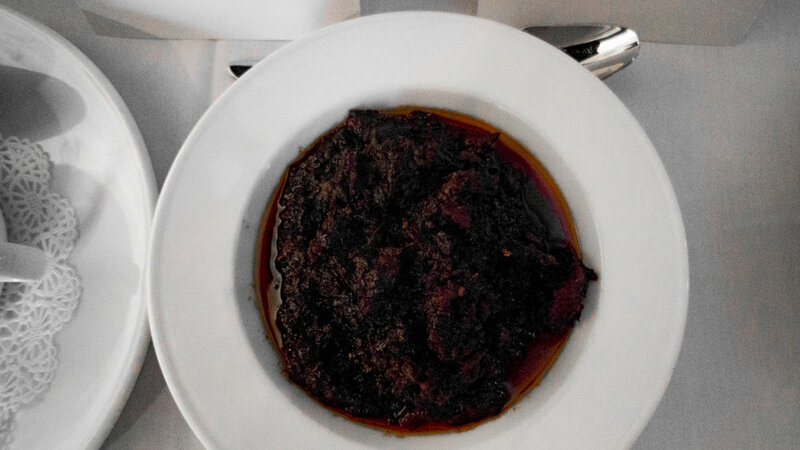 Speaking of that bagoong, about a week ago, I brought bagoong made by my mother to a meeting. Steve and Eph happened to be there and had a chance to have a small taste of the bagoong. What I didn't know until after the Kamayan was over was that little taste was enough for them to base their bagoong off of my mom's. They added some longanisa and of course made it their own but it was touching nonetheless and I'm grateful that they introduced a bit of my mother's cooking to a greater audience. All you need to know about the food was to survey the restaurant after the last course was served and before they laid down the dessert (tapioca pudding with mango). Every single diner was slightly slumped and trying to get comfortable in the way you try to get comfortable because of an all too full stomach. Belts were loosened and smiles stretched everywhere. I was glad to see the staff form Ekiben whooping it up; it was nice to meet Kevin, Steve's childhood friend and soon to be business partner (what? ); and while I didn't get see Papa Chu, Mama Chu was absolutely adorable and filled with pride. I understand the gravitas of the origins of a Kamayan but there is also an important component of community, celebration and family (family adjacent too -- take it from Tito Lenny). If Ekiben and La Cuchara didn't achieve all of those components than maybe I'm the one who's still searching for a definition of Kamayan. It’s taken me a long time to write this post primarily because I didn’t want to ramble and wanted to be concise in my thoughts about this post (but I’m finding out that concise isn’t my strong suit but I sure can ramble). I also wanted some distance to how I wanted to write this post because both Ida B’s Table and Calasag Pop UP are close to my heart. I’m also writing this because it’s a good bookend piece to my post about Calasag’s Kamayan last summer and a good prologue to my post about Ekiben’s 2nd Year Anniversary coming on the weekend. If you didn’t know, this past January 24th, Ida B’s Table hosted a Soul Food x Filipino Food Pop Up in collaboration with Calasag Pop Up. Ida B’s Table is a newly opened (last August/September) modern soul food restaurant that has captured Baltimore’s imagination about how you think about restaurants and soul food in a city that is predominantly African American. Calasag Pop Up is a group of enterprising creatives led by Dylan Ubaldo that periodically hosts Filipino food pop ups in Baltimore. As a Filipino, they have certainly captured my imagination of the possibilities of introducing the ideas of Filipino culture and community through Filipino food to Baltimore. The idea of the meal was to try to bring the best of both worlds to the table together. 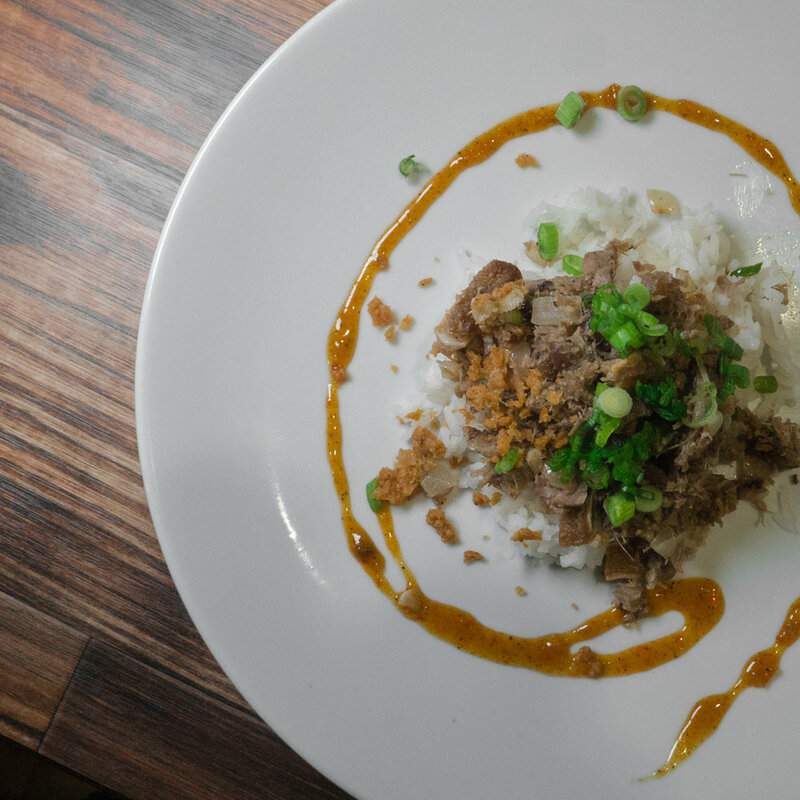 The courses were rooted in Filipino dishes but Chef David Thomas would add ingredients and flavors that reflected his vision of modern soul food. Dylan was assisted by another talented Filipina cook, Maryrose Runk. Alex Dang also created some cocktails with Filipino flavors to add to the night (I thought I already loved ube as much as I could but adding alcohol to ube may be too much loving). Dinner was a melding of some classic Filipino comfort food dishes (though I could argue that all Filipino food is comfort food to me). It started with little shot glass filled with Arroz Caldo or Lugaw or you may know it was a congee. There was roasted chicken in the porridge and a piece of braised octopus (brushed with a banana ketchup, ginger ale & calamansi BBQ sauce) balanced across the rim of the glass. It was served under glass after a quick smoke. The first course was a Catfish Ukoy which used sweet potatoes and collard greens instead of the traditional shrimp and bean sprouts. 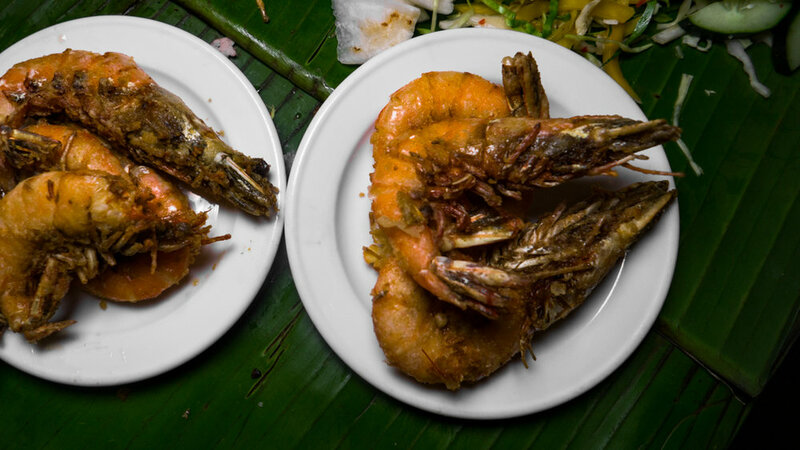 Ukoy is the Filipino version of a vegetable fritter and Ida B’s Chef David Thomas added a head on grilled shrimp for good measure. Second course was an elevated version of the Philippines go to drunk/hangover food, Sisig. 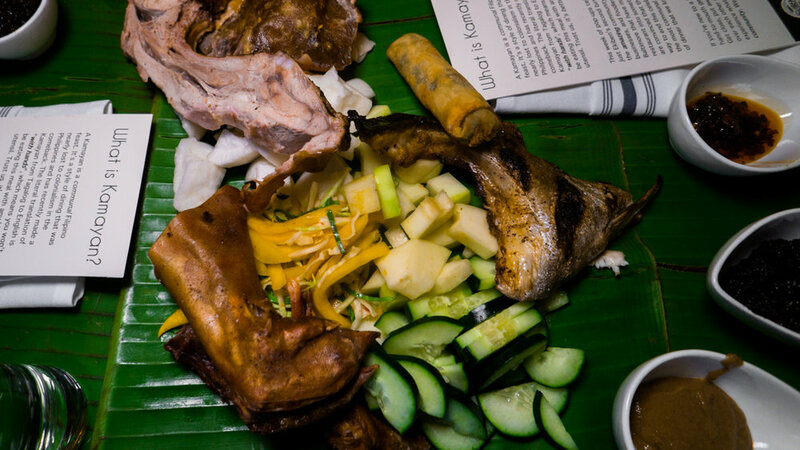 This version included crispy fried pig ears, smoked pig cheek and belly mixed together with coconut vinegar, calamansi, liver spread and chilis. It was served over rice (nice way to sop up all that goodness) and some of Ida B’s signature sweet curry sauce. Dessert was Ida B's beignets with coconut sugar and an ube filling. I am still not ready to say Calasag’s food was better than my mother’s but I’m sure Dylan and Maryrose will understand that. I will say that it was a great representation of two cultures feeding (pardon the pun) off of each other to make a cohesive meal. While I enjoyed each dish in the meal, the highlight for me was the ukoy. 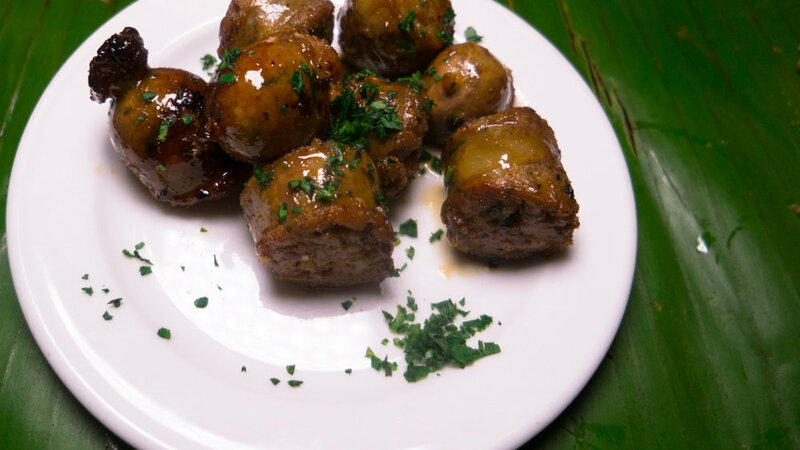 It took traditional soul food ingredients and made it into a classic Filipino dish without missing any of the flavors, textures or distinctiveness of the dish. The shrimp on top was a good touch and added yet another element that Filipinos would look for in ukoy. The best part of the night, though, was the community just like Calasag’s kamayan. Roughly half of the gathering was made up of some of Ida B’s clientele which are primarily African American. It was great to see these loyal customers show up for a different kind event because it shows trust in Ida B’s ability to deliver great food and meaningful experiences. The other half was made of young Asian Americans who came out to support some of their own. It was a veritable Chinatown Collective (see what I did there?). Also, it was great to meet LieAnne from Dear Globe Coffee Roasters. She’s a fellow Filipina and more importantly, she’s working towards opening her own artisanal small batch coffee shop in Baltimore. It makes me smile that Ida B’s has grown such a great customer base that they would try something as different as a Filipino Food x Modern Soul Food collaboration. However, my heart warms when I saw how many Asian Americans (and Asian adjacent friends & family) came out to support other Asian Americans regardless if they were Filipinos or not. Whether they came out because they were friends with Dylan, Maryrose or Alex or they were curious about Filipino food, there was a palpable sense of community throughout the night. I’d like to believe that there was a shared joy in the experience of an event that highlighted a culture’s cuisine. A joy that comes from growing up Asian in North America where celebrations of our cultures were rarely found outside our communities. That joy is a fine line though. In this case, there was a Filipino at the helm of the dinner working with another minority chef who has also worked hard to highlight cuisine that may not have gotten enough recognition for its origins. In the case of Filipino cuisine, it’s been pegged as the new breakthrough Asian cuisine (which is even problematic for the millions of Filipinos who have been eating Filipino cuisine for generations) so it’s only natural for restauranteurs, regardless of their race, to see that as an opportunity. The issue, which applies to most “popular” ethnic cuisines, is how that opportunity is treated. Will the culture behind the cuisine be treated with respect and honored? Will it be unfairly be appropriated for some sort of gain? Even if it is treated with respect and honor, will it matter to the affected communities if it isn’t one of them leading the effort? These are all incredibly difficult questions. Stay tuned. But, for at least one night, Filipino food was highlighted and honored in a way showed Baltimore how great the community and culture could be and there’s nothing wrong with that.